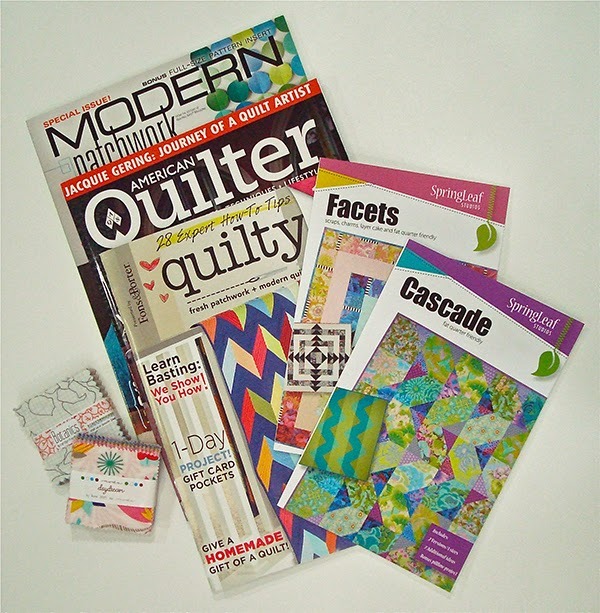 Thanks to all of you who stopped by during the Quilter's Blog Hop Party. I know it takes a lot of time to browse through all the great blogs that participate so I appreciate the time you gave to my blog. I do hope you will continue to come back often. I'd love to get to know you better. Confession of a number generator newbie here. I did the widget thingy on the website and chose the number before putting the widget here. Now I see I did it wrong so I can't show the widget with the correct number. Take my word for it . . . it was lucky number 75!!! Who just happens to be . . .
"Your work is awesome! Now following on bloglovin. 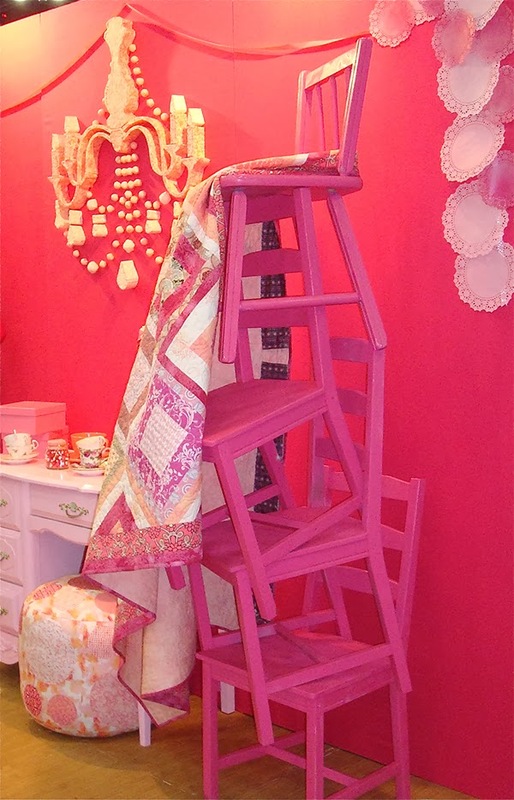 I love modern quilts, but I also love some traditional quilts, so I fall in the middle somewhere!" Congrats Christine! Look for an email from me and I'll get your package in the mail. For all of you here in the States, Happy Thanksgiving! 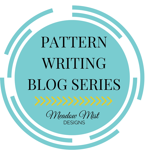 A quick post on a WIP Wednesday at Freshly Pieced. I joined another bee. This bee is part of our newish Boulder Modern Quilt Guild. 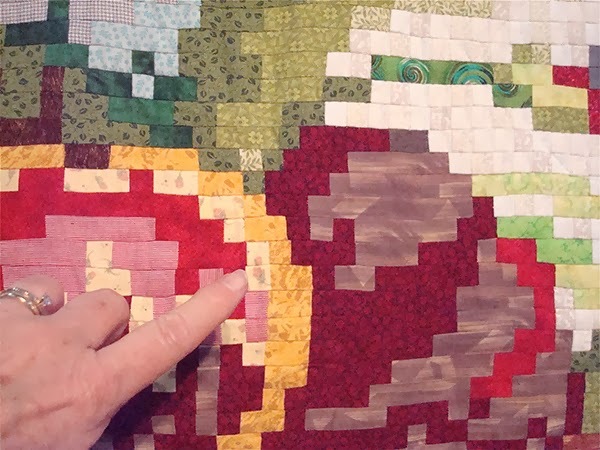 Amy is making a Christmas quilt so she had us whip together these easy cross blocks. She made blocks in the opposite color groupings and then started to piece it all together last weekend at our sew day. It's going to be a really cute Christmas quilt. I usually go more traditional for Christmas but this is very fun. Here's the block. She wanted us to leave the sections separate so she could mix them up for even more scrappiness. Can't wait to see how Rene' pulls them all together. I've never made a spiderweb block before and now I'm thinking maybe I should make some more. We used this tutorial. That's it for my bee blocks. Now I need to make a mug rug for our guild Christmas party. Happy Thanksgiving and God Bless. 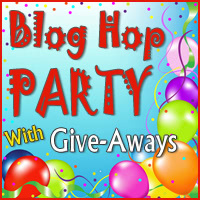 Welcome to my blog if you are hopping over to visit as part of the Quilter's Blog Hop Party. Thanks to Michele for hosting this great event! There are some great giveaways happening. Who knows . . . maybe you will be one of the lucky winners! Since I just recently returned from my first time at Quilt Market in Houston, I am giving away my own version of a mini market swag bag of goodies to 1 lucky follower. 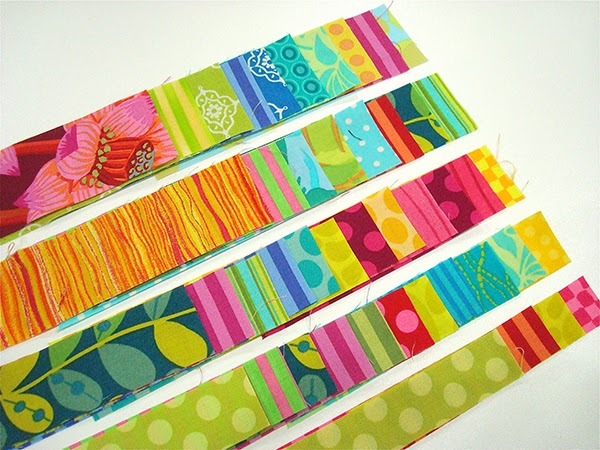 1 mini charm pack (2 1/2" squares) of Carolyn Friedlander's brand new fabric line "Botanics" from Robert Kaufman. 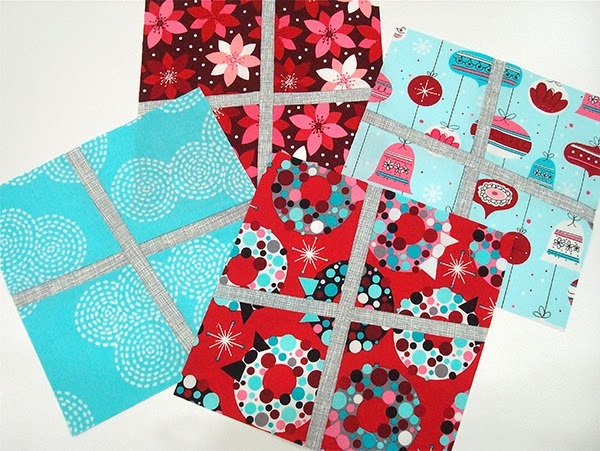 1 mini charm pack of Kate Spain's new fabric line "Daydream" from Moda. your choice of one of my current patterns in a PDF download format emailed directly to you. You can see more about my patterns here. That's $46.00 worth of goodies!! For a chance to win, simply become one of my followers by email, RSS or Bloglovin and leave a comment telling me how you chose to follow. I'd also love to know what type of quilter you consider yourself to be. Modern, contemporary, traditional? Winner will be announced here Nov 27th and receive an email notification. US/Canada only please. Thanks for stopping by. I sincerely hope you'll make Springleaf Studios one of your regular blog stops. I will be releasing new patterns the first of the year with more to follow throughout 2014. 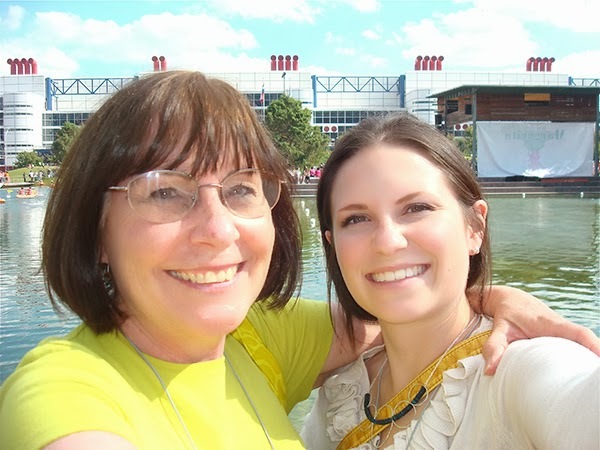 I'm also linking up with Cindy at Live a Colorful Life for Really Random Thursdays. Good luck and happy hopping. 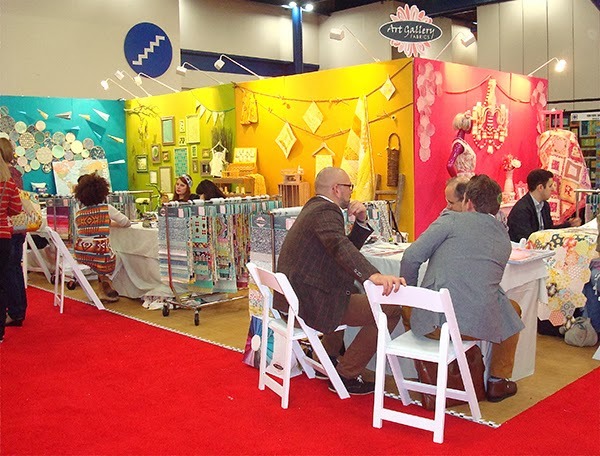 What is Quilt Market without the vendors and their fabulous booths? There's everything from the simple, clean design to over the top extravagance. 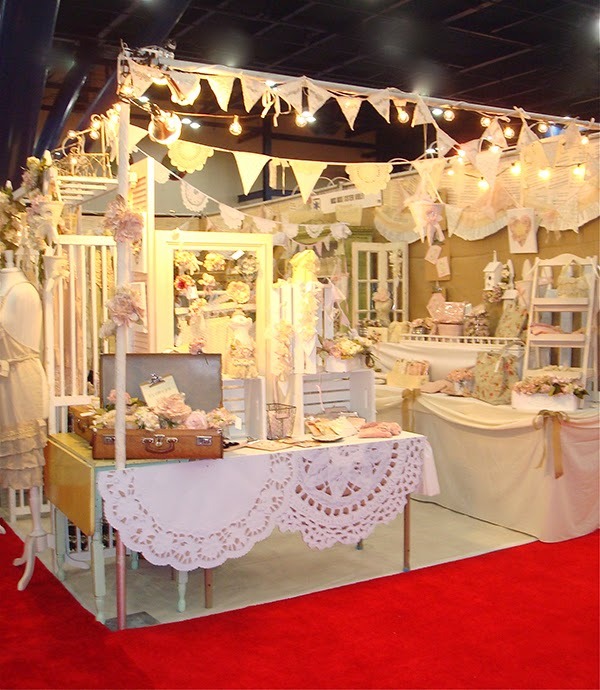 Much the same as with the quilt exhibition, it's hard to take in all the details of booth after booth. Here are some of my favorites. 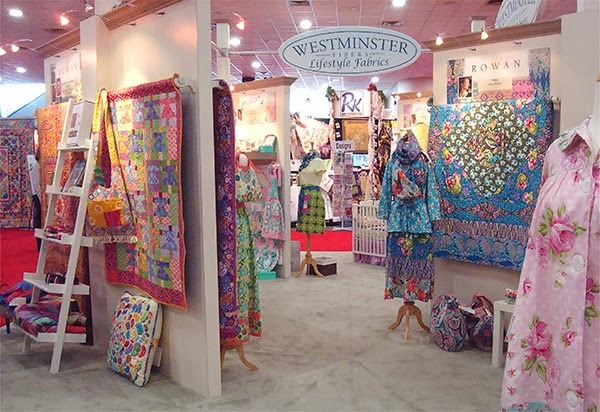 First up is the Westminster booth along with some of their individual designer booths. Westminster/Free Spirit is one of my favorite manufacturers. 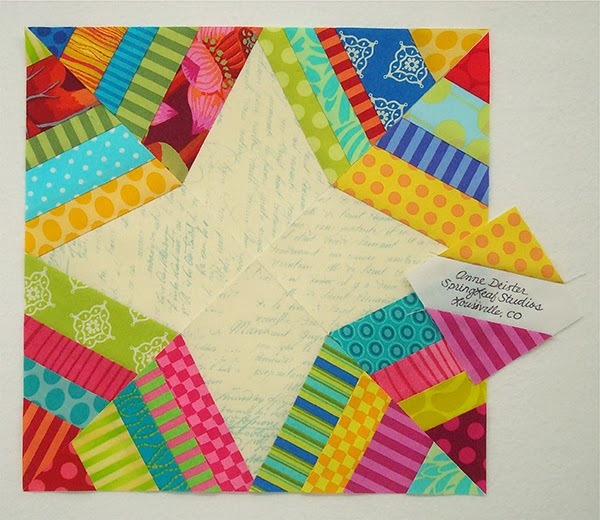 Kaffe Fassett, Amy Butler, Anna Marie Horner, Tula Pink, Joel Dewberry . . . what more can I say? 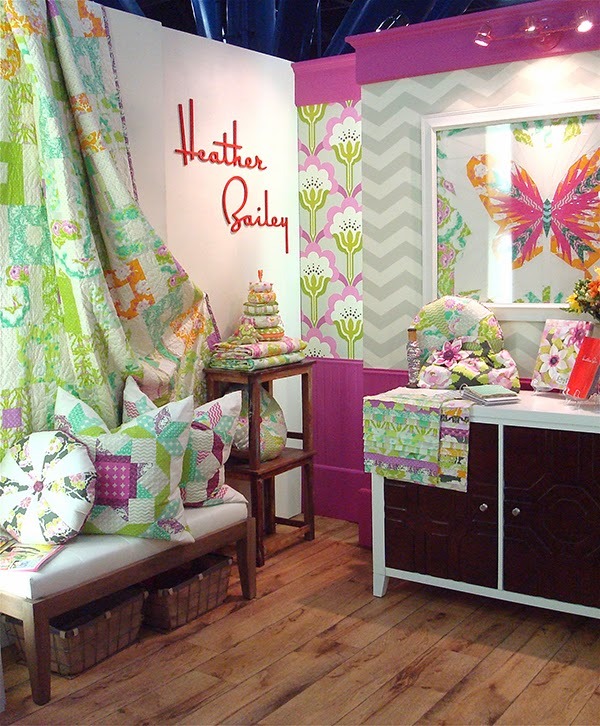 Heather Bailey's booth showcasing Lottie Da. 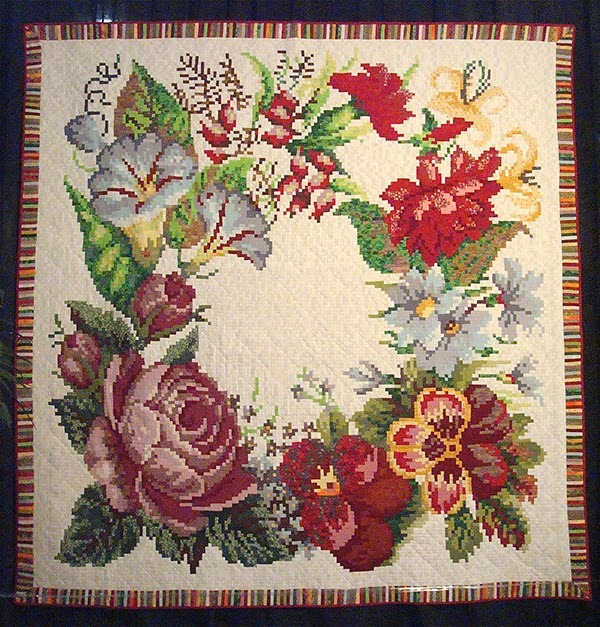 The butterfly is a framed pieced quilt. Fantastic detail. 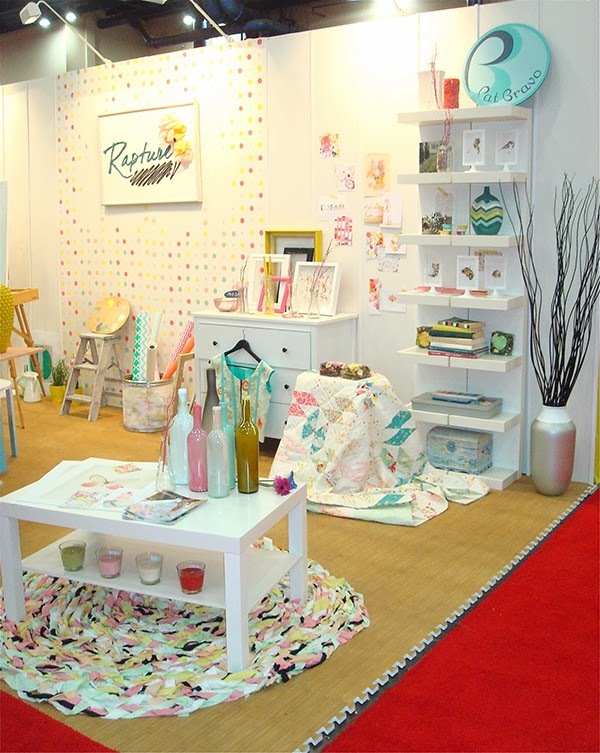 Anna Marie Horner's booth showcasing her new True Colors and Dowry. 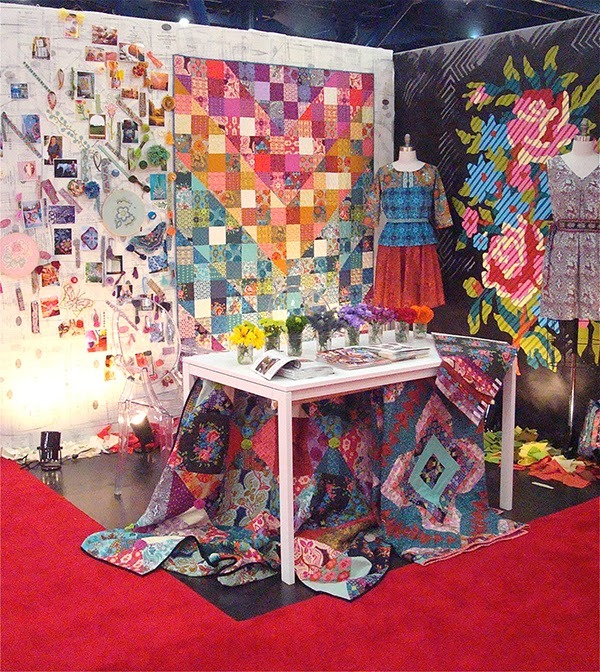 I love how the inspiration wall blends right into the quilt design. 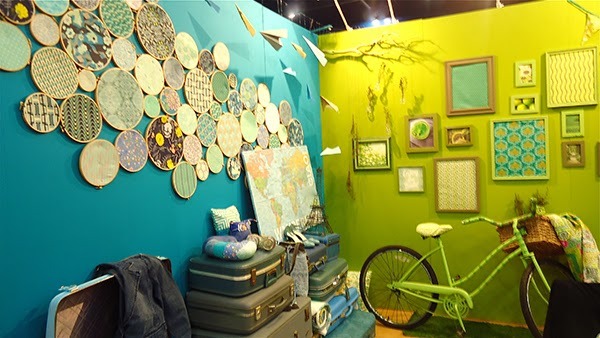 Art Gallery also had eye-catching booths completely filled with color down to the tiniest of details. 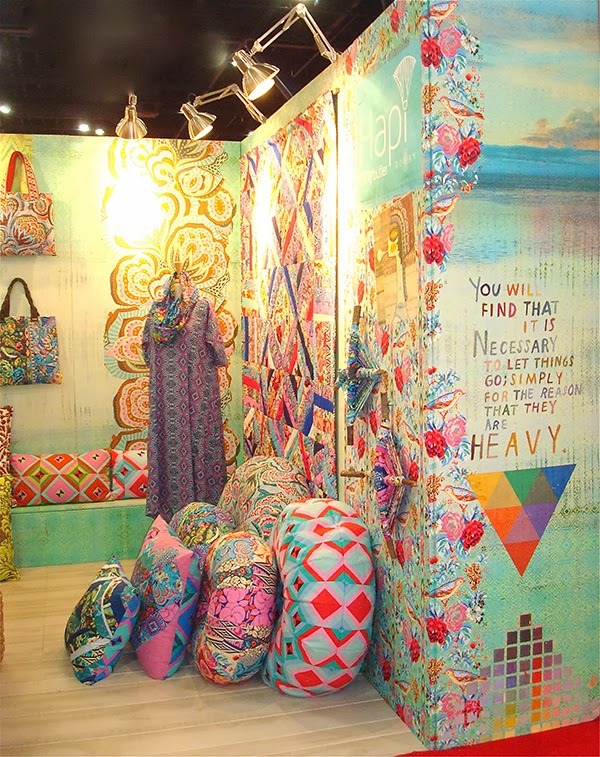 Love their fabrics too . . . especially their new basic lines. Pat Bravo's newest collection Rapture will be in stores soon. 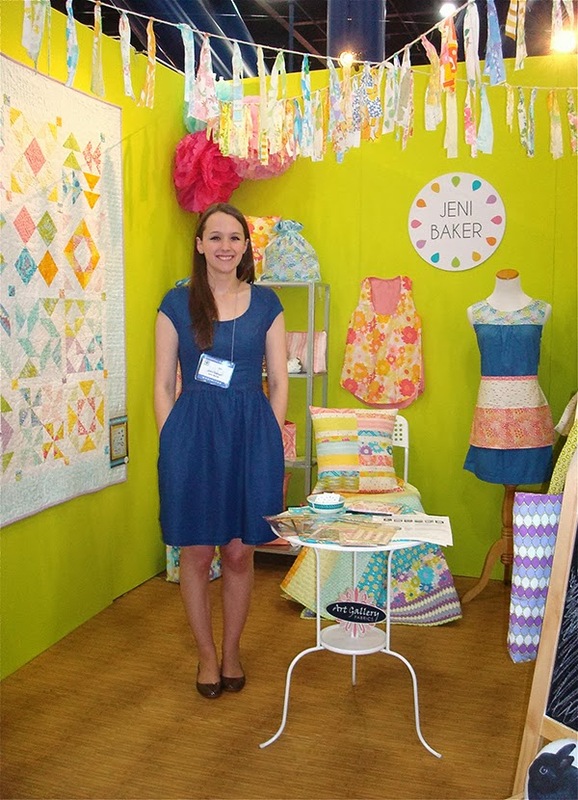 I can't wait for Jeni Baker's new line Dreamin' Vintage which comes out in April. I'm really liking this line a lot. Might go really well with the vintage sheets I've been collecting. 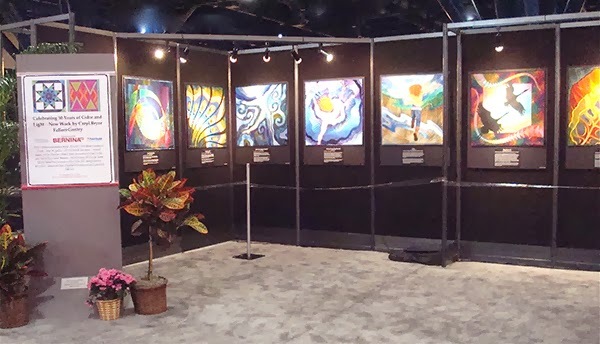 Art Gallery's newest design Frances Newcombe's booth. She won the Best New Exhibitor Award. 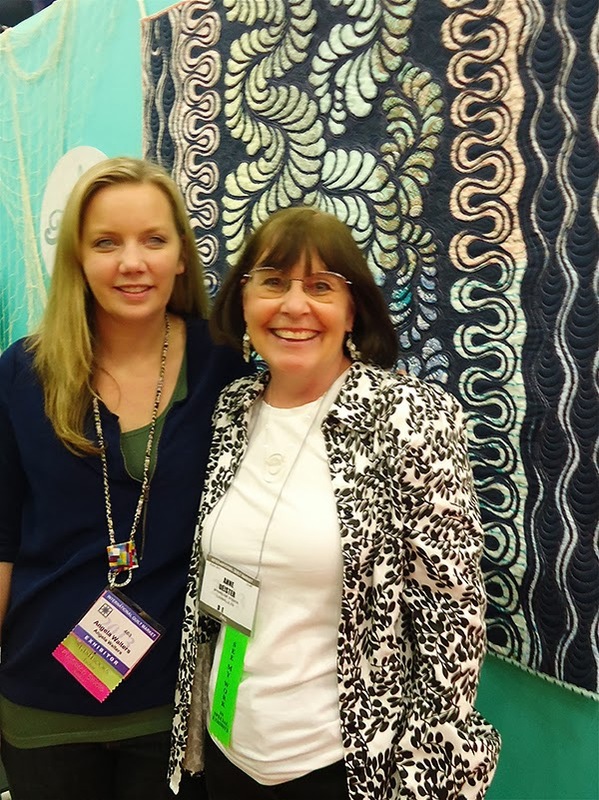 Angela Walters was such a sweetheart and her quilt was absolutely stunning. You can see more info on how she did it here. It's worth taking a close-up look. 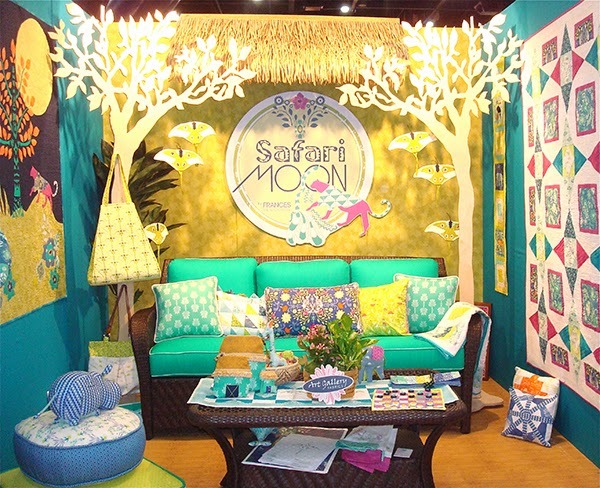 And just a few of the other amazing fun booths . . .
Who knew batting by itself could be so interesting? Amazing textures on their batting tower. 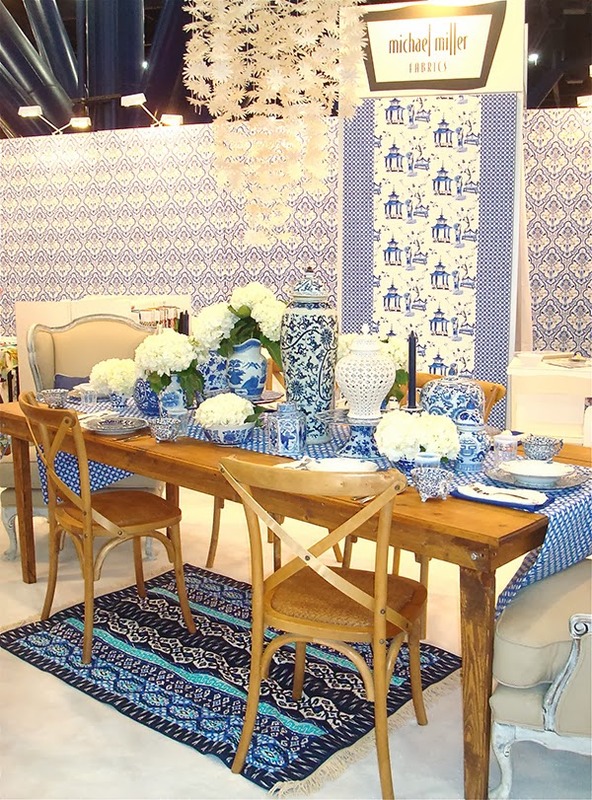 Just a very small portion of the very blue booth by Michael Miller. This table setting was gorgeous. Hope you liked my little Market tour. Wish I had even more detail shots as well as better photos. As I've said before . . . so overwhelming it was hard to take it all in. Today I'd like to share some of the quilts from Market that caught my eye for one reason or another. This show is so huge that it could literally take days to truly take in all the quilts, garments and other things being shown. I'm afraid I didn't do the show justice because there was just too much to see and not enough time. Enjoy. 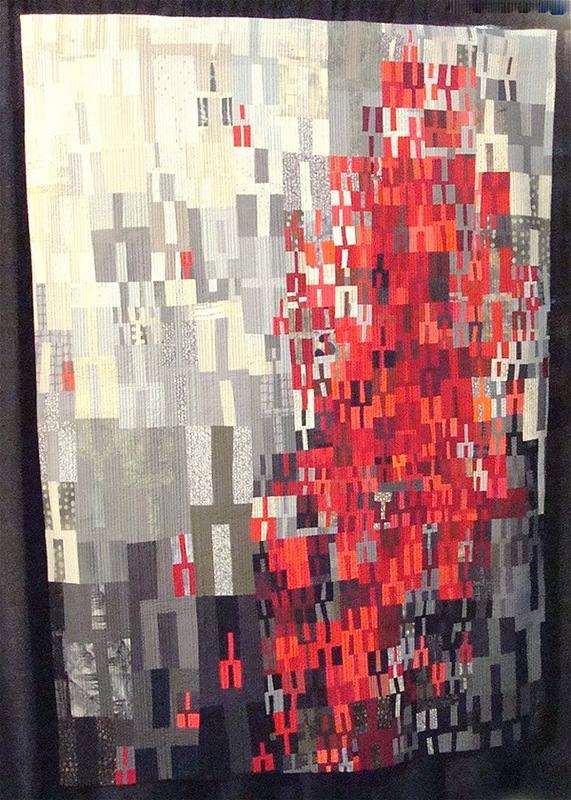 First up is one of the quilts shown as part of the Modern Quilt Guild Showcase. 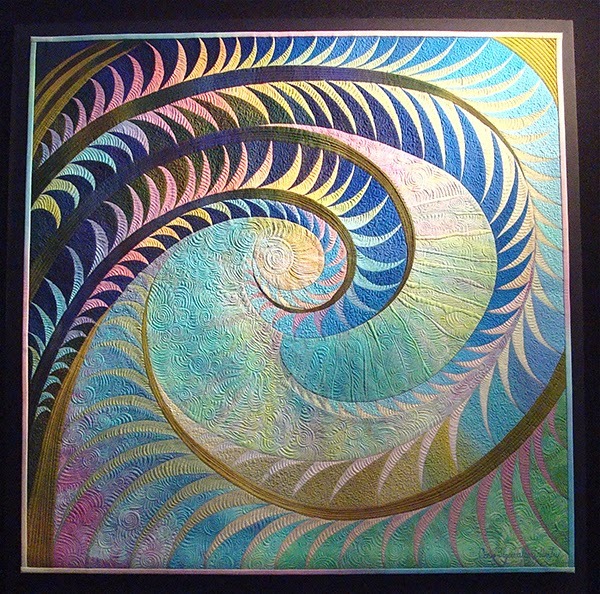 My quilt "Rhythm & Blues" was also a part of this special exhibit. 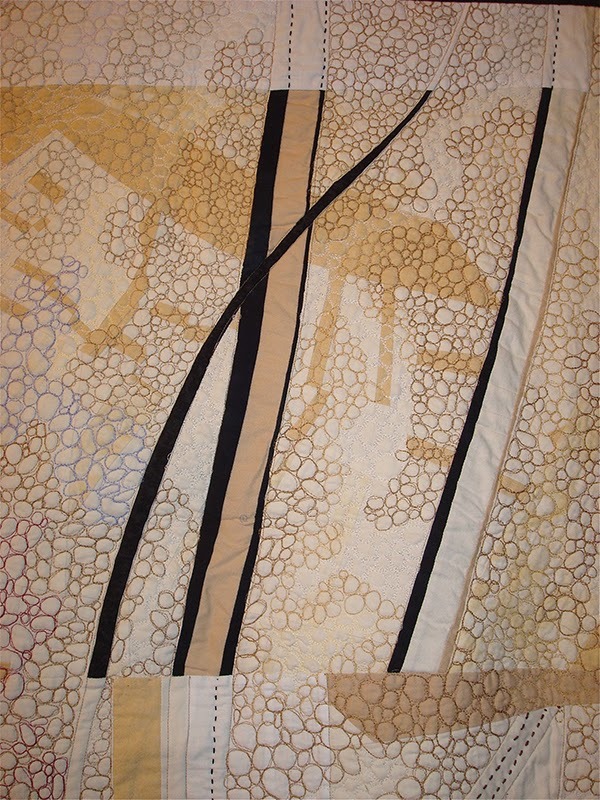 Go here to see all the modern quilts included in this special exhibit. 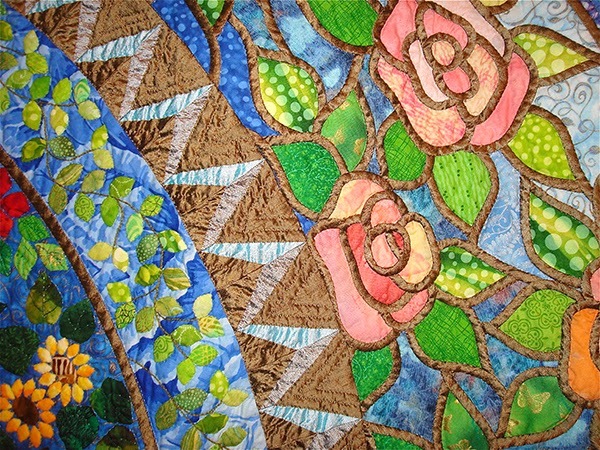 They will also be shown at International Quilt Festival in Chicago June 19-24, 2014. 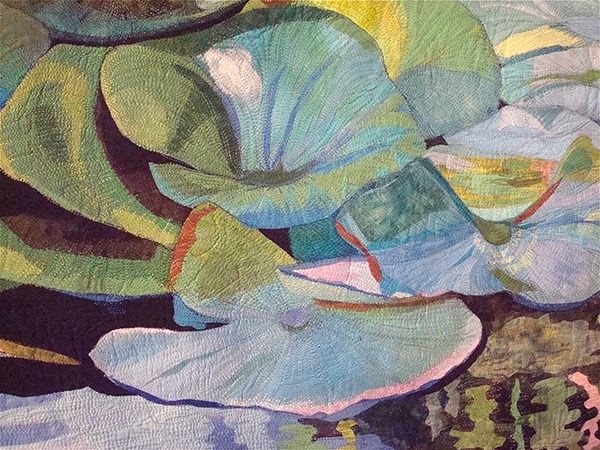 I am always attracted to impressionist type quilts with floral and nature themes and have much admired Melinda Bula's work. Someday I'd love to make a floral quilt based on her style. In my dreams . 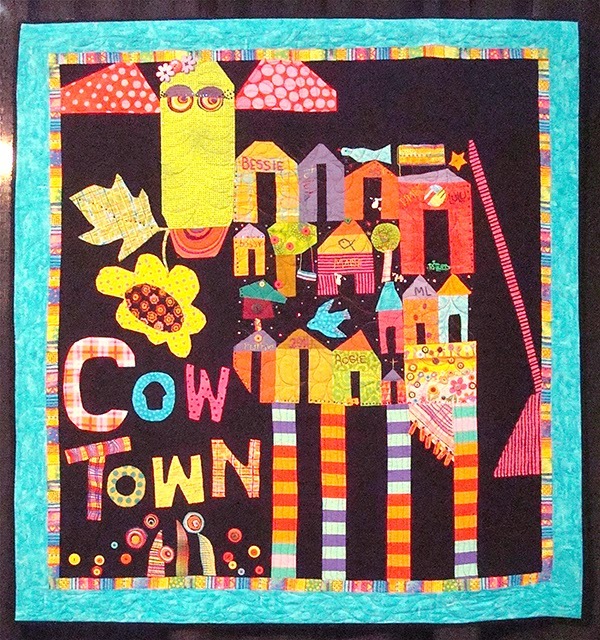 . .
Another quilter whose worked I have long admired is Ruth Powers. 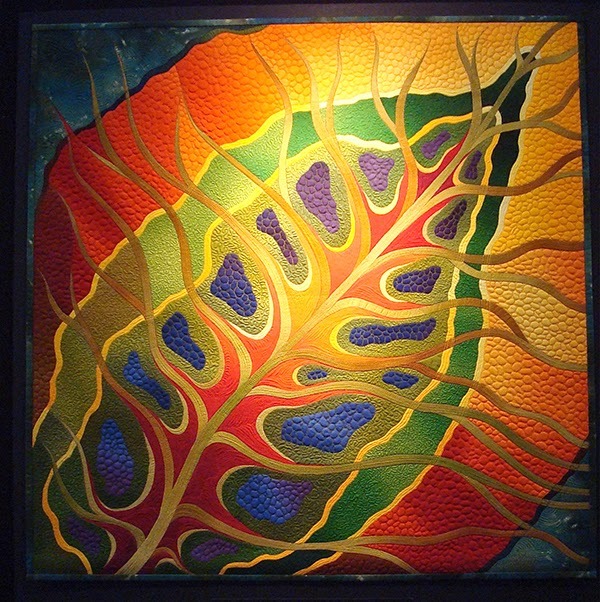 Her work is similar to Ruth B. McDowell's in that they both often do fractured landscapes. Would like to try one of these some day too. In another dream . . . 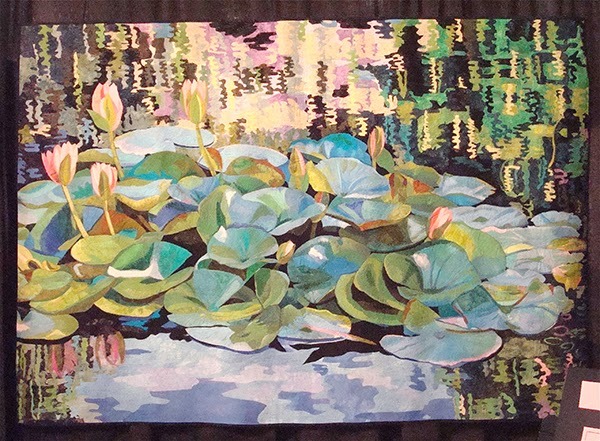 The lighting in this quilt is stunning. 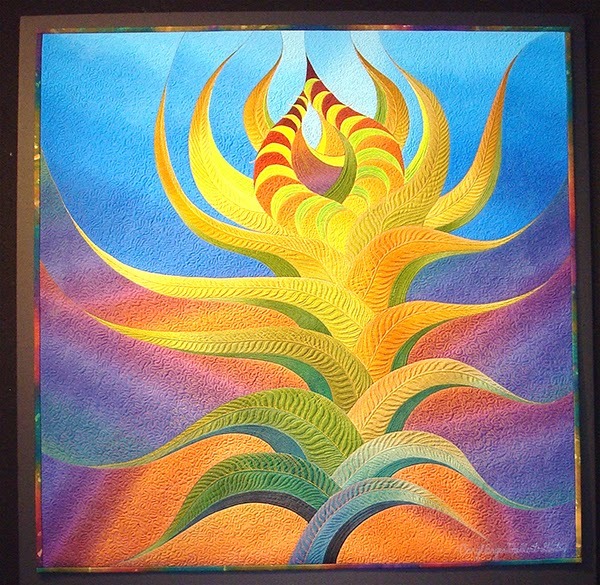 For me, one of the show highlights was the 30 Quilts for 30 Years exhibit which featured 30 quilts by Caryl Bryer Fallert-Gentry. 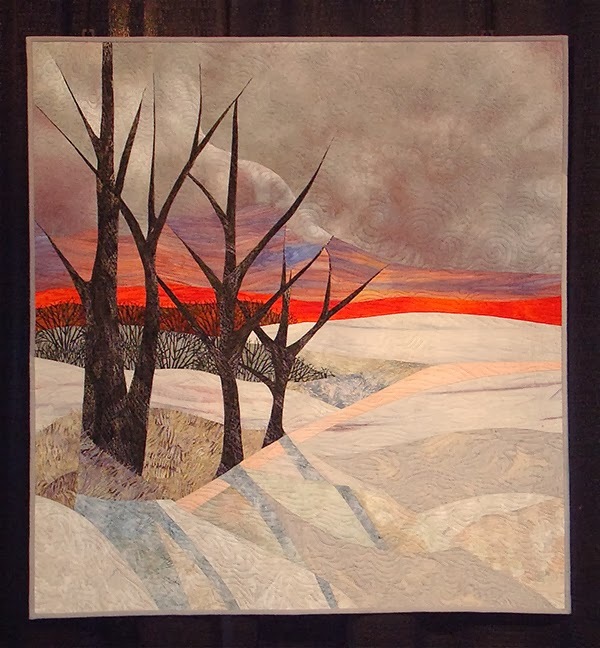 2013 marks Caryl's 30th year of quilting so to celebrate she created 30 new quilts. Go here and scroll down to the show dates to learn where this special show will be appearing. 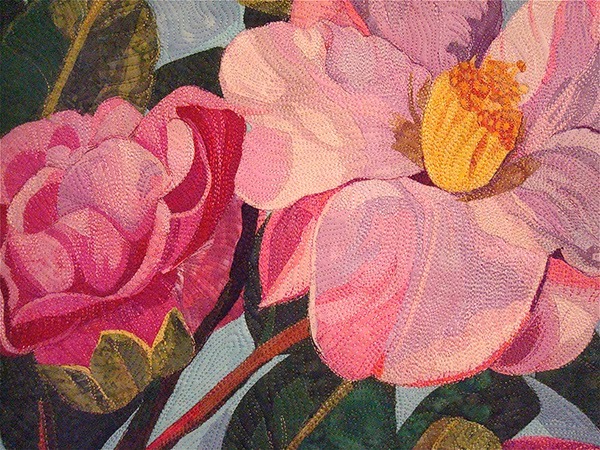 If it's anywhere near you, I highly recommend going to see these fabulous quilts. Seeing her work up close in person was stunning. 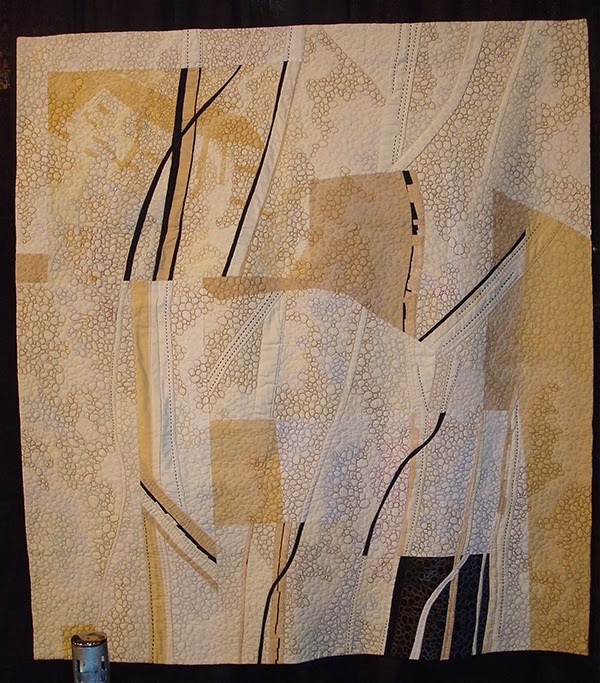 I love the organic shapes she frequently uses in her designs and the texture created through her quilting is simply breathtaking. And here are a few of the other quilts that I found inspiring. I can't even imagine having the skill or patience to make most of these. They are so wonderfully executed. 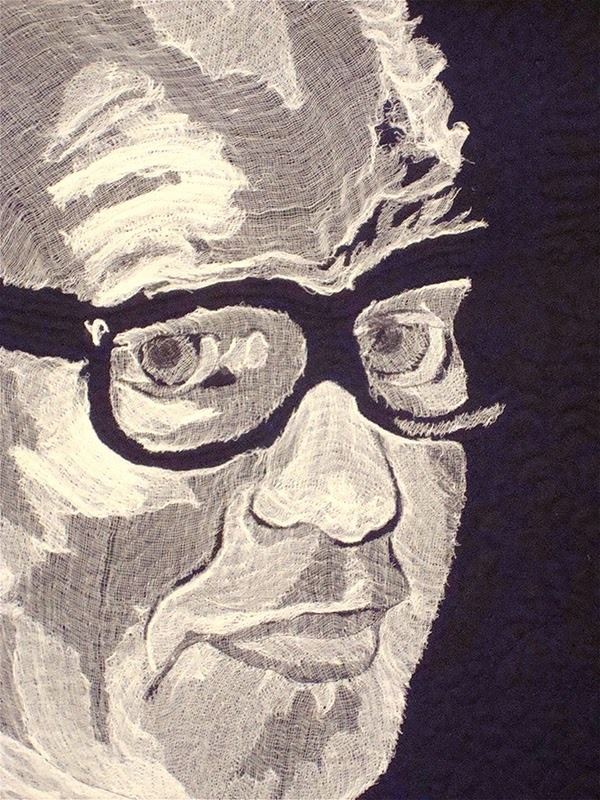 I was fascinated by the use of cheesecloth to create the face. 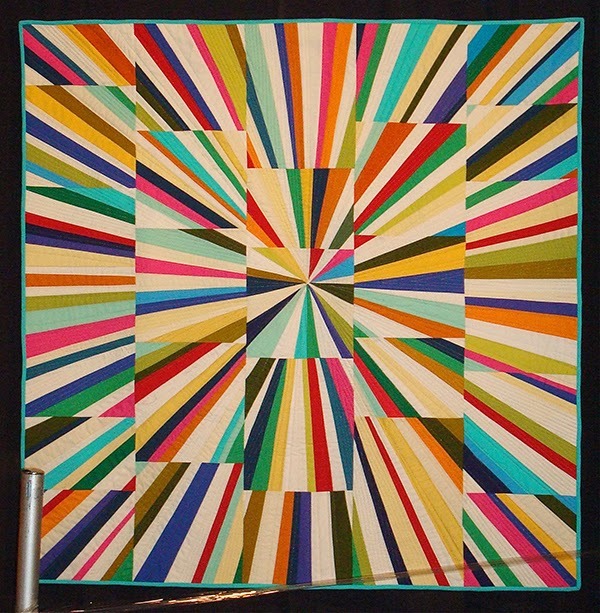 Love the color and improv look of this quilt. From a pattern in the book Out of the Box with Easy Blocks by Mary Lou. 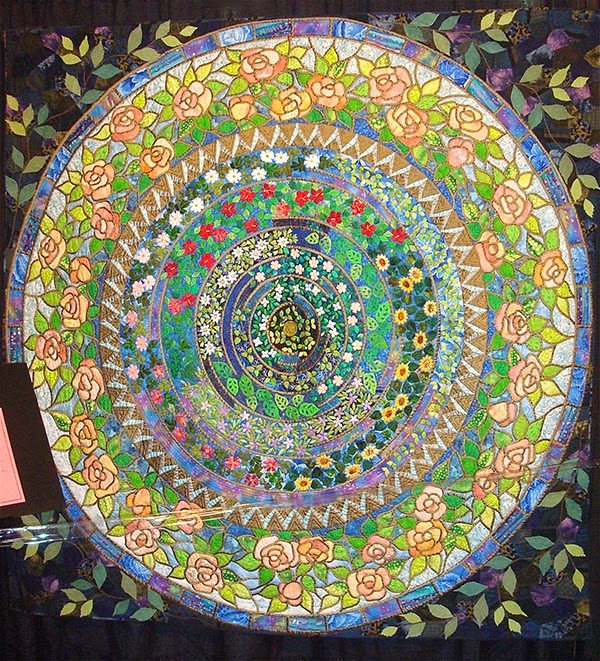 An unbelievable applique based on a European dome roof design. Those brown lines were about 1/4" in width. Don't worry . . . I didn't touch it but I wanted to show the scale of those teeny tiny squares. Talk about patience. As you can see, there is a wide variety of quilts in this show including many lovely traditional beauties. Gorgeous applique and stunning hand quilting was well represented. 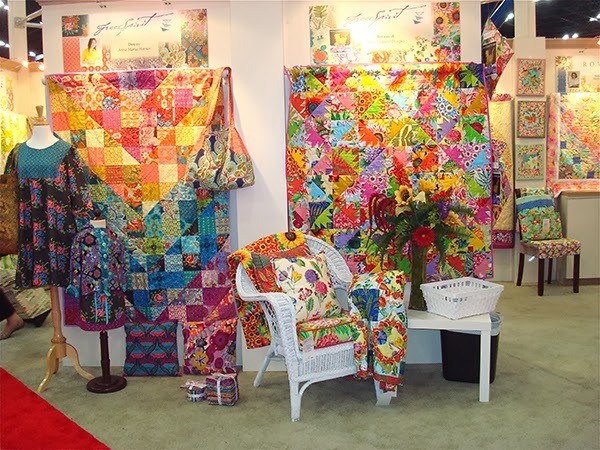 Even if traditional and art quilts are not your style, you can never go wrong attending a big quilt show. The caliber of work is beyond my imagination and very inspiring. 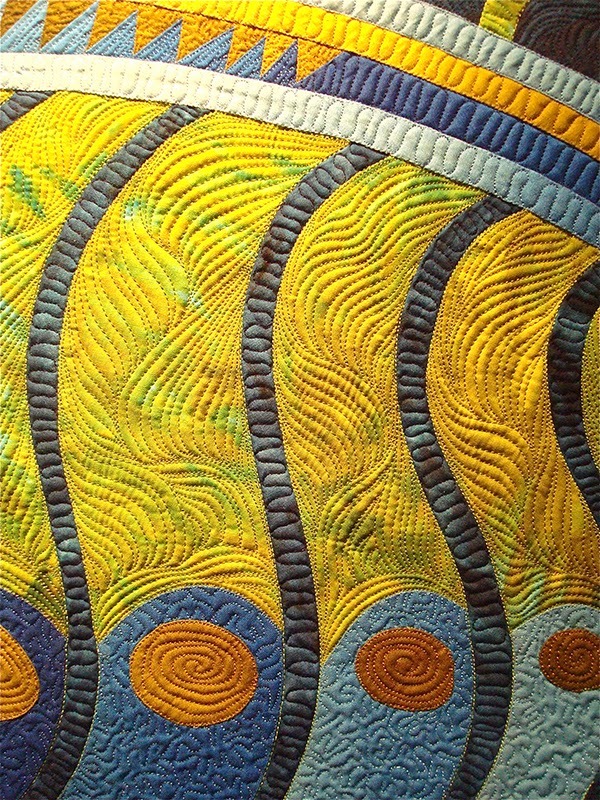 It is so valuable to see the skill and creativity of a prize winning quilt up close and in person. As quilter's, I believe we should admire and appreciate ALL types of quilting and support one another in whatever style we aspire to. 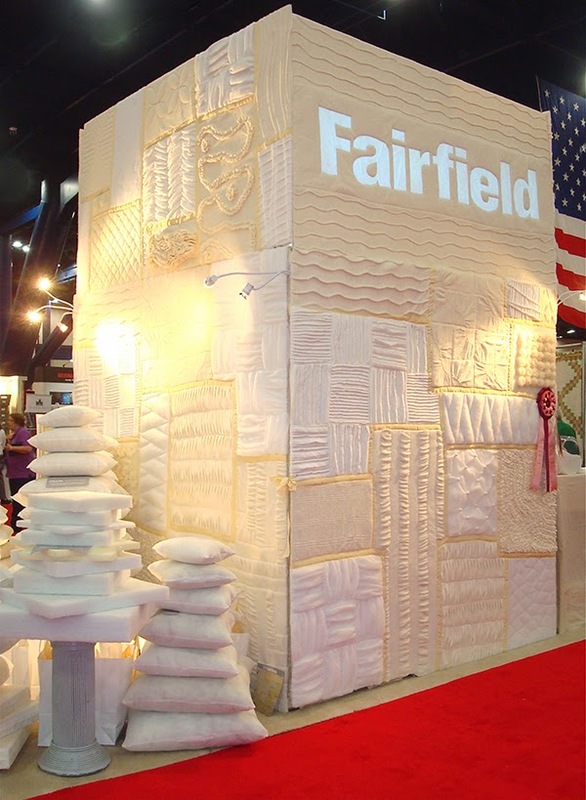 Hope you've enjoyed the quilt show. It's been exactly 2 weeks since getting home from Quilt Market. And exactly 2 weeks since getting the crummy cold that drained me of all energy. The cold is still lingering but so are the wonderful memories of Market so I'm finally posting about my experience. 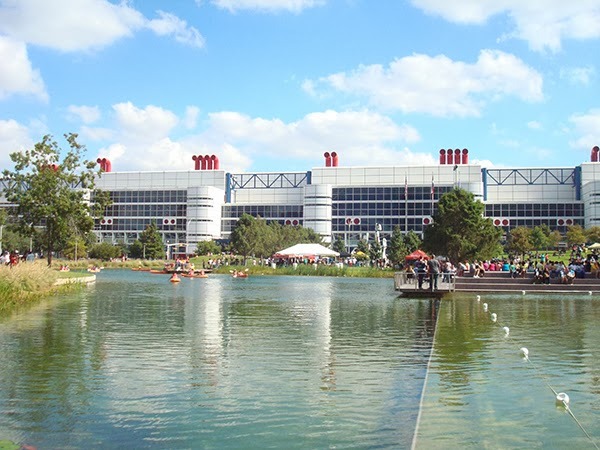 The convention center is HUGE. Can't even get a photo of the entire building. The main reason I decided to go was this . . . 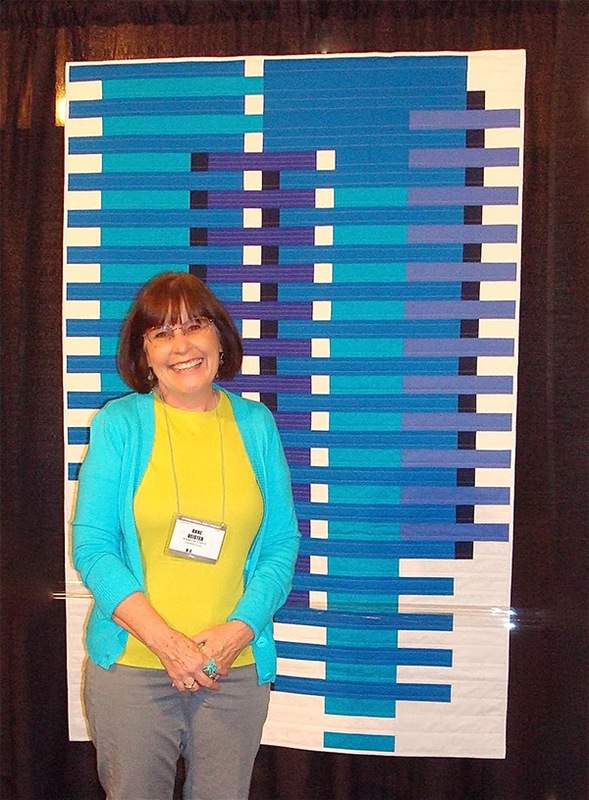 I entered "Rhythm & Blues" into the Modern Quilt Guild Showcase and was honored to have it selected as one of seventeen quilts chosen to represent the modern movement in quilting at both Market and Quilt Festival. It even made it into the Market brochure listing all the classes and exhibits going on. Needless to say this was our first stop when we entered the show. 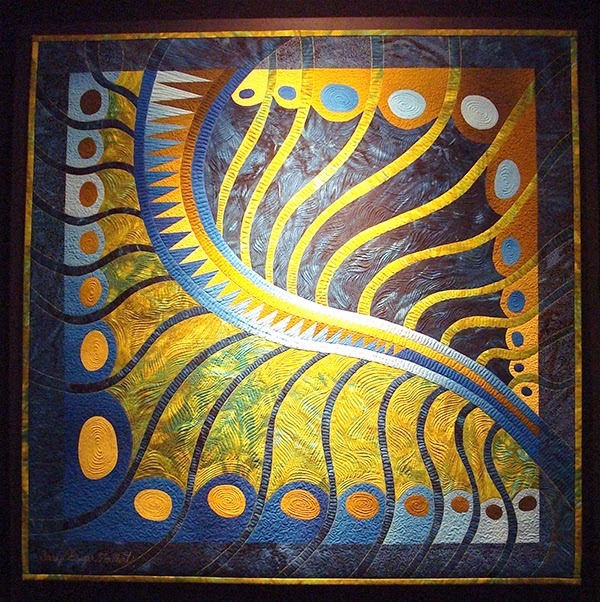 I'll show some of the fabulous quilts from the exhibit in another post. 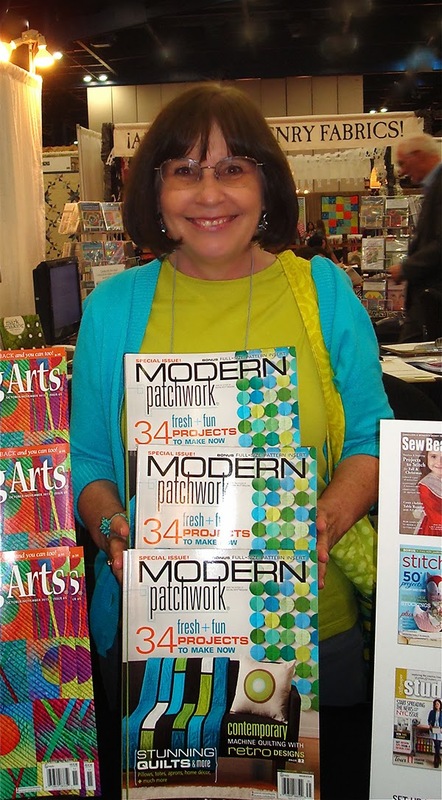 Once I saw my quilt, we headed into the exhibition hall in search of the Generation Q Magazine and Interweave Press. I've been fortunate to work with both of these publishers and hoped to meet the editors in real life. We came across the Interweave booth first where I was excited to see the issue with my project on the cover being displayed. Met some of the great sales people and in talking with them found out Marlene lives just blocks from me in small town Louisville. Couldn't believe that one. Amber is the editor I have worked with and we saw her several times on the floor in deep conversion with various people. In retrospect I wish I had interrupted because I never got to meet her in person. Hi Amber . . . I saw you! 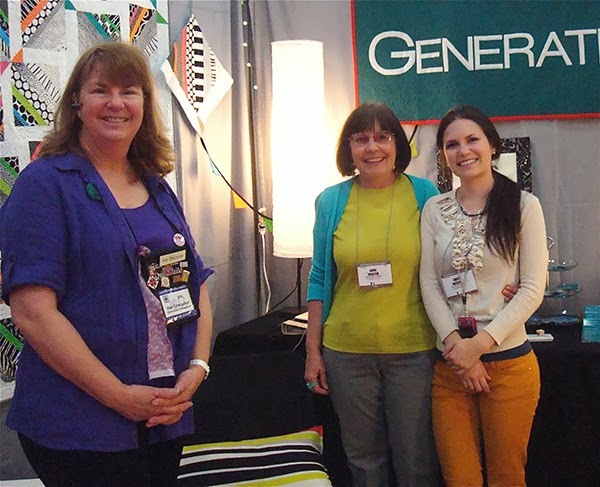 Next up was GenerationQ Magazine where I was very surprised to see a quilt I made for them hanging in their booth. It hasn't been published yet and I didn't expect to see it there so that was a thrill. When I introduced myself to Vickie who was manning the booth she jumped right up and gave me the biggest hug. I had not had any direct contact with her before and yet she instantly made me feel so welcome. 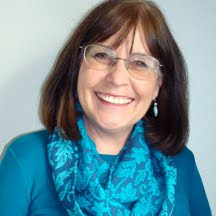 Thanks Vicki, you were just what I needed to start my Market experience. 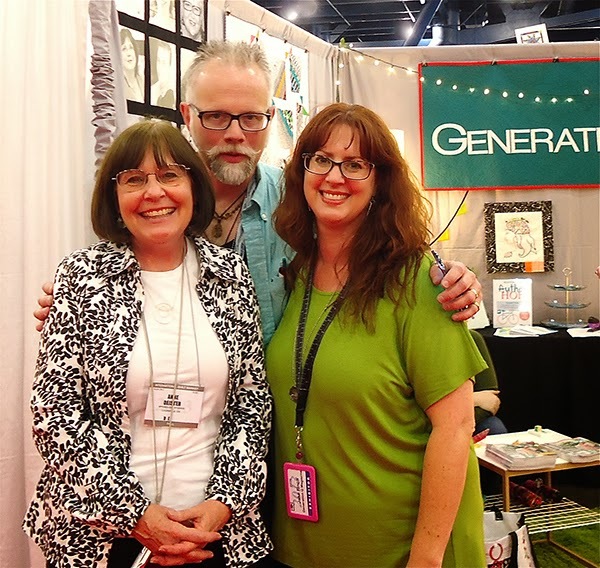 Eventually I was able to meet the rest of the GenQ team and there were lots more hugs all around. They truly were all just so nice that I feel blessed to know people like Jake and Scott in the industry. Go buy one of their magazines and help this great start-up. They're on a roll now publishing 6 times a year. Jake Finch and Scott Hansen, my main GenerationQ contacts. I have to say that one of the things that stood out about Market was the people. 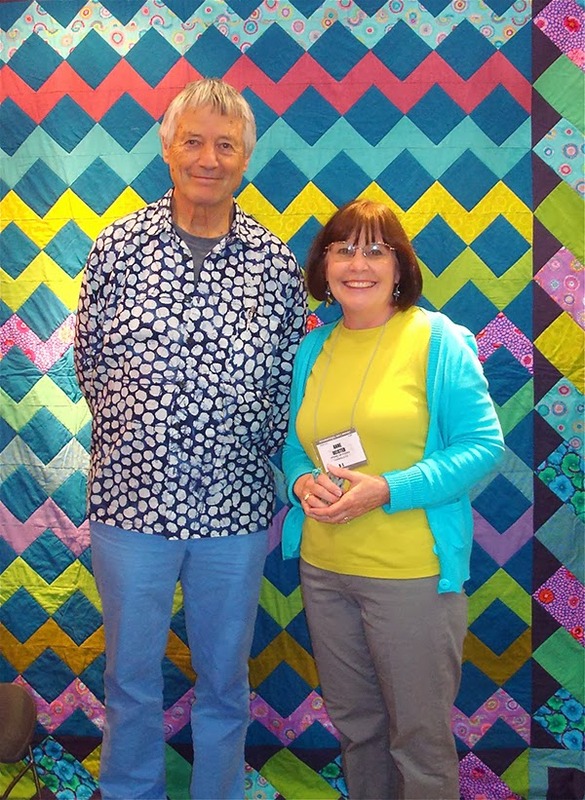 And I will admit to being a little (ok, A LOT) star struck by seeing people like Amy Butler, Anna Marie Horner and Kaffe Fassett. For those of you who know my work, you know I'm a huge fan of Kaffe's fabrics so it was a thrill just to get my picture taken with him and be able to give him my business card with a pic of my pattern Cascade on the back which features his fabrics. He loved the quilt which was quite flattering. Kaffe and I . . . I match his quilt. Definitely one of the best things about the entire trip was that my lovely and talented daughter Emily came along for the adventure. Market wouldn't have been nearly as much fun without her and it certainly would have been more intimidating if it hadn't been for her. Thank you Emily for being such a strong supporter of my quilting. Hop over to her Etsy shop Emily Claire Studio and see the fabulous jewelry she makes. She's wearing one of her pieces in the pic below. Isn't it great? I'll be posting more about the booths, the quilts and other Market things in the coming days so stay tuned. Might even be a giveaway tucked in there somewhere.